He helps me drive down green leafy streets. for his name is Lizard. For you are with me, your tail and your hunt, they comfort me. and you will dwell in my dashboard forever! Enough of that! I'm sure it will tick some fool off. Apparently, my Jeep has been moved into. I'm used to having these little things slip into my house. They are never a problem, you can't get bit if there are no real teeth. They are entertaining to watch, and beneficial since they eat all those insects that love to bite me. 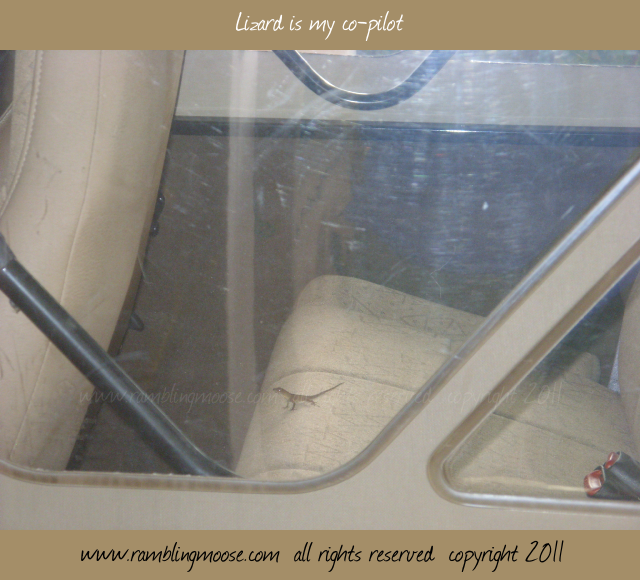 This particular lizard is in my Jeep. The Jeep is in front of the house, all the windows are closed. It sits in my carport, and apparently I've given it shelter. The little thing is on my back seat. It rode with me the other day to a restaurant and back and is none the worse for wear. Jeep Wrangler Soft Tops aren't exactly water tight. Sure, you're shielded from the elements, but there are gaps in the roof where geckos and lizards can get in. Hopefully my little riding partner is smart enough to get out of there when he has eaten all the insects that decided to move in.